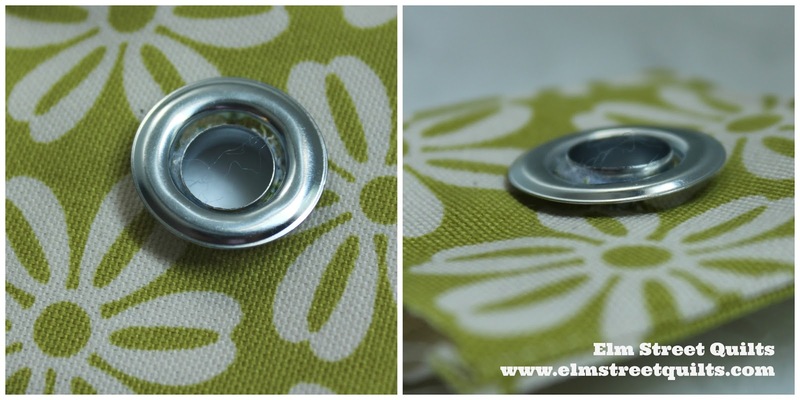 A grommet is installed in a two piece set - the actual grommet (on right in photo above) that you will nest your fabric on and the washer (on left in photo above) that will secure the fabric to the grommet. In addition to the above you'll need a hammer, a hard flat surface and safety goggles. The anvil from this kit has a channel running through in which the grommet will fit snugly. This is helpful for installation but it also means that you'll need setter and anvil tools specific to the size you are installing. 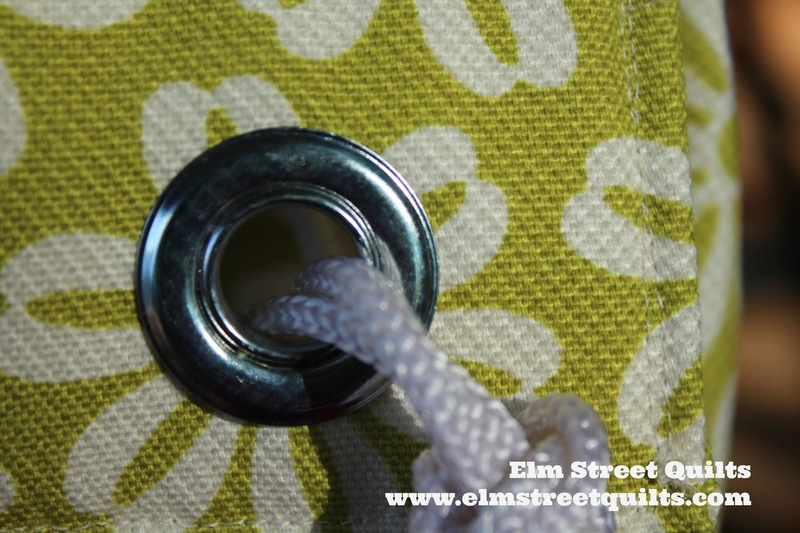 Working with directions from your pattern or tutorial, mark the hole for the grommet by placing the grommet in the proper place and tracing a hole. 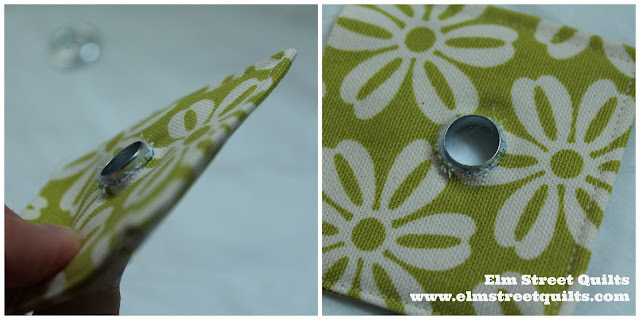 Cut out the hole carefully so that it is just large enough for the grommet. Wearing safety goggle, place your grommet 'sandwich' on the anvil and insert setter tool. Make sure you are using a very hard surface. This large flat rock in my garden worked very well. Carefully tap the setter tool with a hammer. 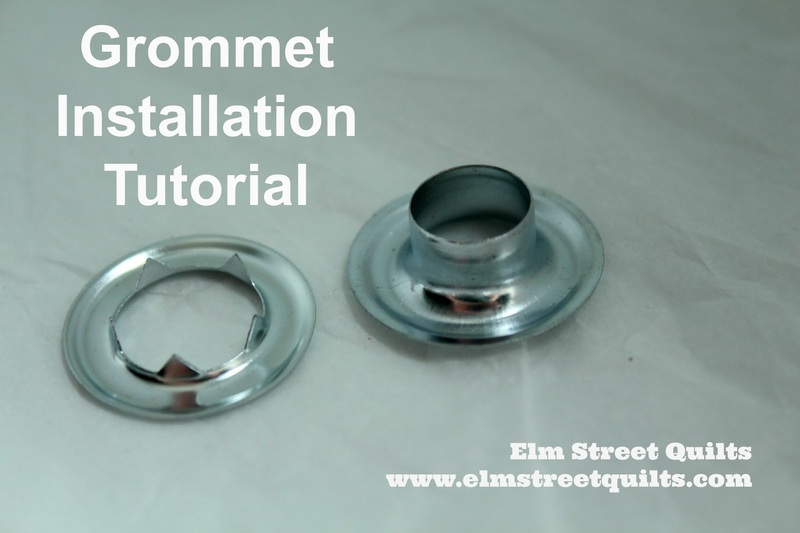 It will take several taps to completely bend down the shaft of the grommet. Congratulations - you just installed a grommet! Sign up for notifications on news about Bag It! I want to thank you for reminding us of the techniques we will be using. Ahh.. another tool I need to get. Crossroads quilt top is done! Start your (sewing machine) engines!